I want to go to San Francisco! Electrolux is teaming up with Foodbuzz at the 2nd annual Foodbuzz Festival. They have an oven that actually has a Perfect Turkey Button! How cool is that? So they are asking for recipes for side dishes, appetizers or desserts since they already have the turkey cooking taken care of. I really want to go the Foodbuzz Festival – I have so many foodie friends in California! Lara, Kate, Amanda and Andy, Lynn, and Pubsgal, just to name a few! So I started thinking. I have hosted Thanksgiving probably a dozen times in my life. One thing that is always tough is planning all the food so that its done at just the right time. Then it hit me – soup! 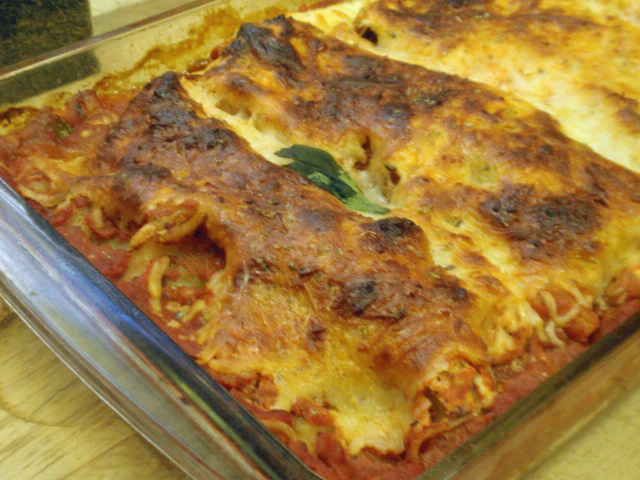 It can be made ahead, its a great first course, and this one is not only delicious, but it will be a show stopper at your next Thanksgiving. 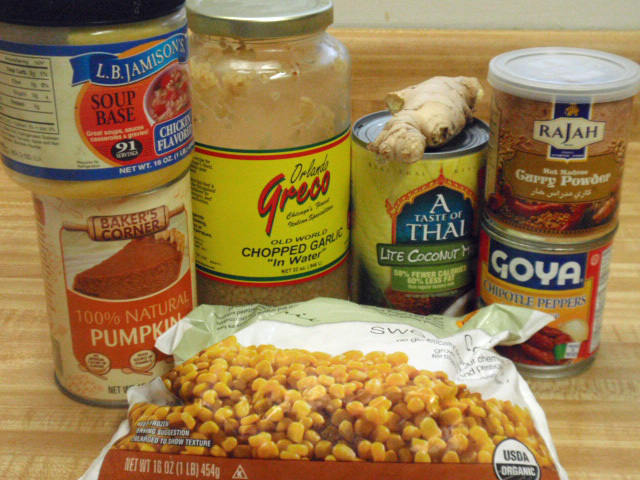 Mix all the ingredients, except corn, in a pan and simmer for 15 minutes. Meanwhile, put the frozen corn on a cookie sheet – sprinkle with salt and pepper and broil until the corn starts to turn golden brown. Using a stick blender, puree the soup. 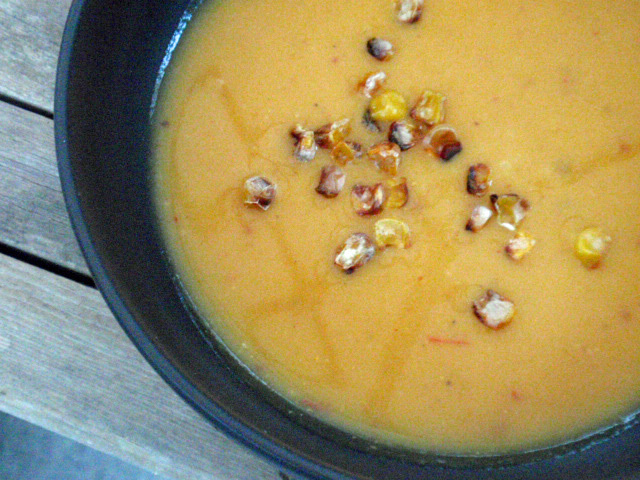 Place the soup in 4 separate bowls, adding 1/2 cup of the corn kernels to each bowl. 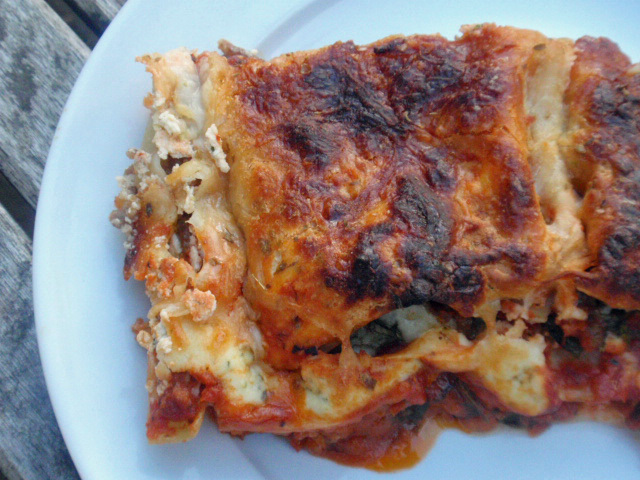 Funny thing is – this recipe came together with everything I had already! Literally this soup goes from start to finish in less than 15 minutes. 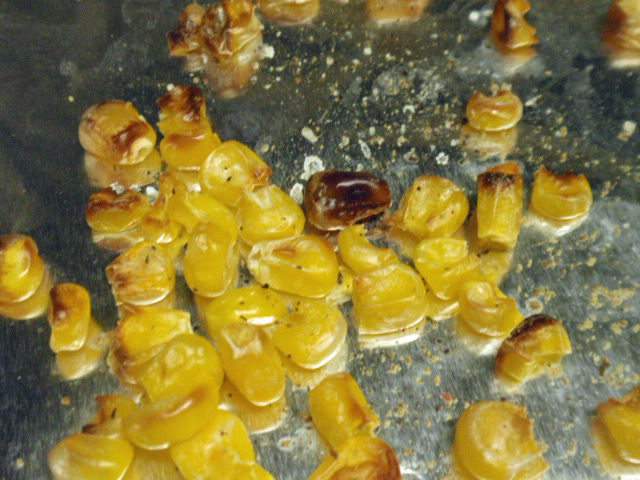 And be careful roasting the corn – I went from frozen to broiler – and they do actually start to pop on your cookie sheet as they brown, hence the roasted “popcorn!” Be careful – you need to pay attention otherwise they go from golden brown to black super quick. I pushed myself so hard I thought I was going to puke – I have the type of personality that’s all or nothing – hate that sometimes! I ended up walking for 15 minutes on the treadmill for a cool down. 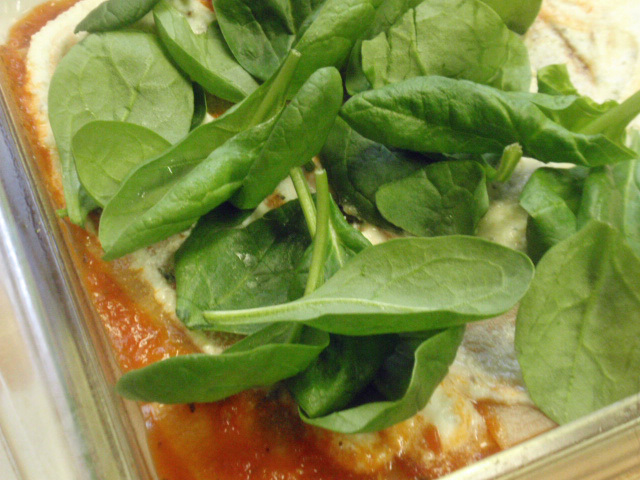 Lunch was leftover lasagna with a side salad – I need to eat salads more often, a great way to get more veggies and fruit in. 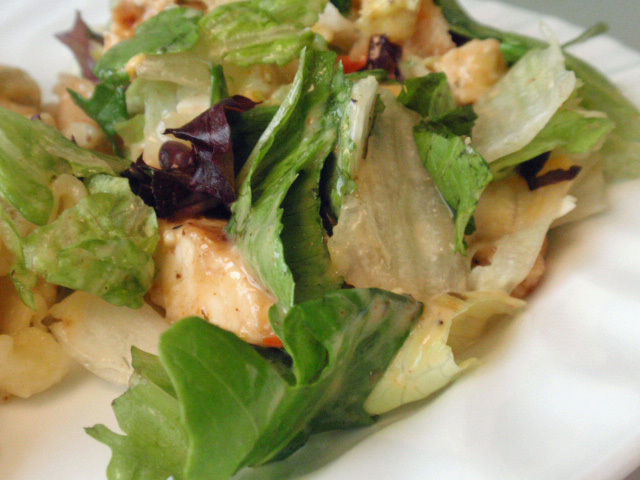 with Boathouse brand reduced fat Parmesan dressing - so good! And to Hannah, my cleaning OCD daughter, thanks for all your help yesterday! Mind you, I don’t have a dirty house by any means, but let’s just say my standards and Hannah’s standards are not the same. I could leave a glass on the counter for a day, put a drinking glass next to a coffee cup in the cupboard, and maybe ignore some dog hair on my kitchen floor. and I’ve lost my exercise mojo. I walked for 30 minutes before my blood sugar stopped me in my tracks. When I got back to the office it was 60 and dropping fast. 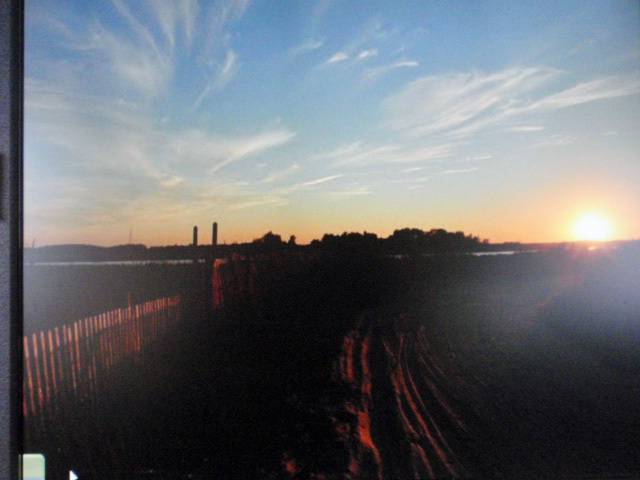 Even so, I felt like I was just going through the motions – no purpose, no effort. 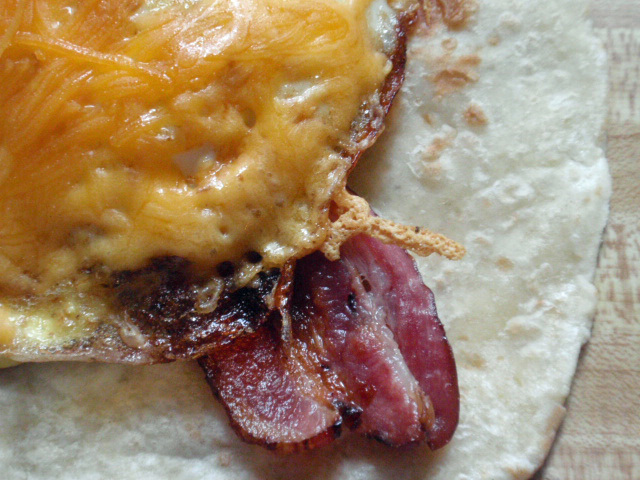 Breakfast was another roti breakfast sammie, quickly becoming a favorite. 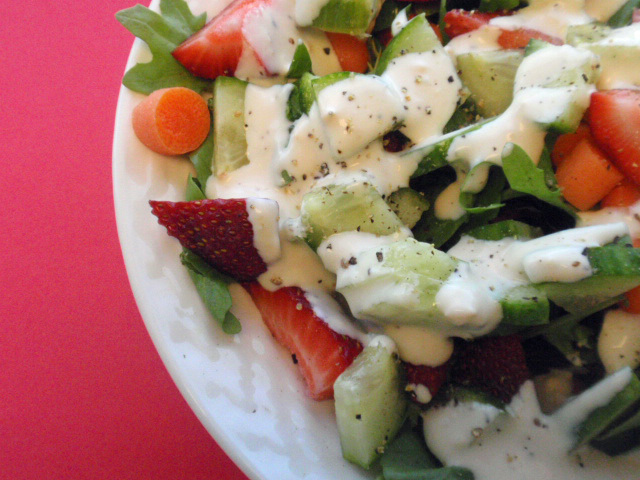 With strawberries on the side. 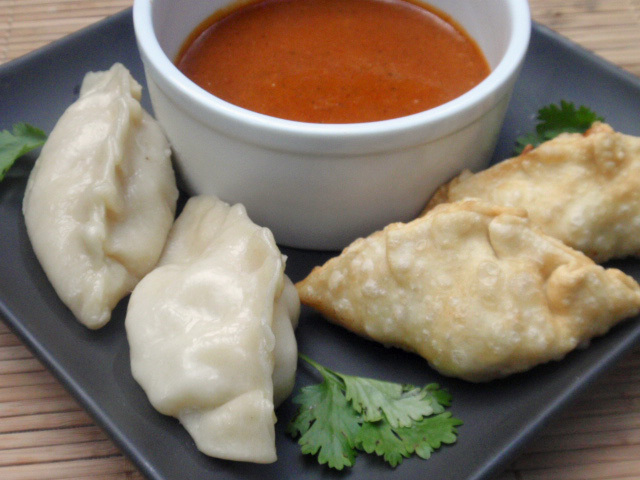 When I made the momos for round 2 of the Foodbuzz Challenge (shameless plug – go here to vote for me if you haven’t already!) Hannah and I both thought that the steamed ones would be better in a soup. I ended up using 2 cups chicken broth, 1/3 cup light coconut milk, a handful of spinach (added after the soup was heated up) and sliced jalapenos to spice up the broth. 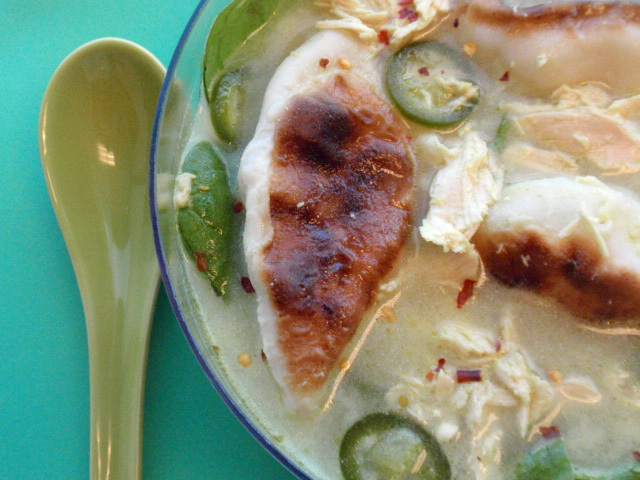 I added three of the momos to my soup – this was so good! So my sister chose pork as this weeks BSI. 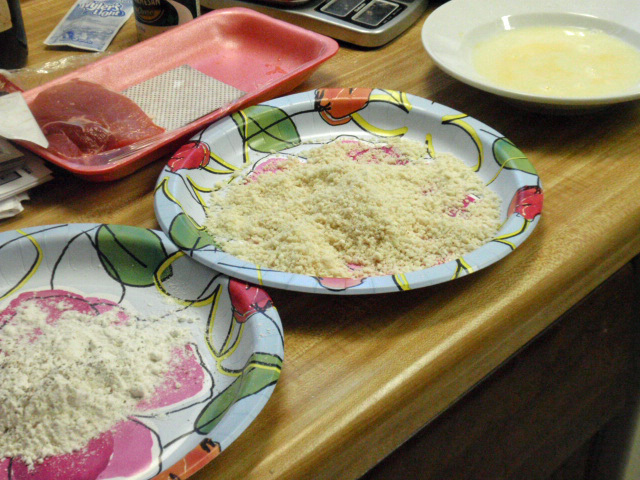 I make chicken parmesan a lot, so I decided to make a Pork Milanese – the best part is that there is no real recipe here – one plate is flour seasoned with salt and pepper, the second bowl is equal parts milk and egg beaters, and the last plate is equal parts of panko bread crumbs and parmesan cheese. I pan fried the chops in 1 tablespoon butter, 1 teaspoon vegetable oil and Pam. These chops were pretty thick, so it took about 20 minutes total. On the side I had mashed potatoes and stuffing. 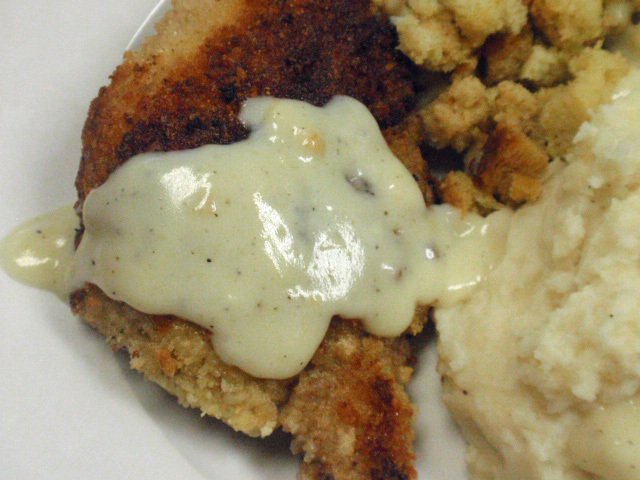 The country gravy was easy – 1 1/3 cups milk, 3 tablespoons flour, salt, pepper and 1/2 teaspoon of better than bouillon. Just mix together and in about 8 minutes it gets nice and thick. Thanks for all your comments about my eyes – turns out I had viral conjunctivitis – I have to put drops in my eyes four times a day for the next 10 days and I should be good to go. Look at how tiny the bottle of drops is – at a price of $65! 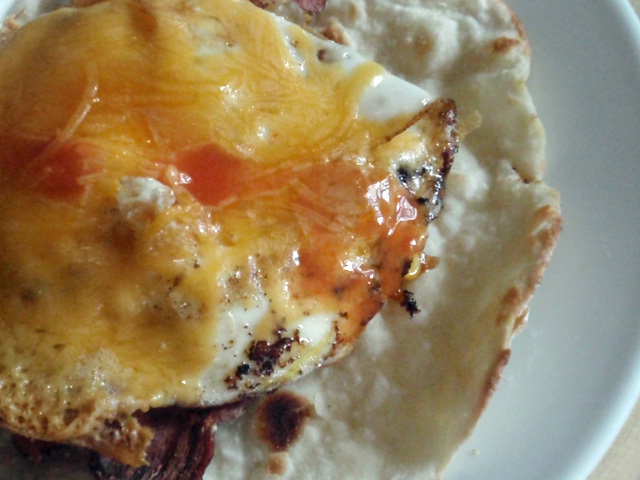 I had another egg sammie on one of the rotis I made. 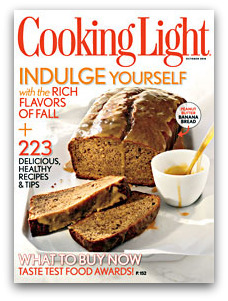 I had to wait until 9 to call my eye doctor, and when they told me the earliest appointment was 11:30, I thought I had plenty of time to make Cooking Light’s Peanut Butter Banana Bread that is on the cover of October’s issue. 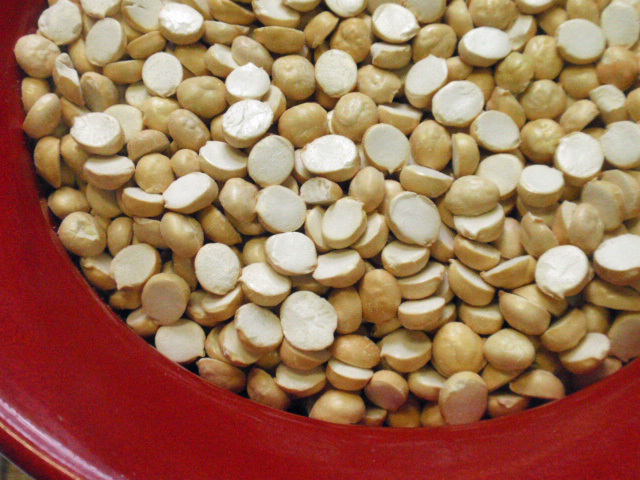 The secret is there is two tablespoons of chopped peanuts mixed in the batter. 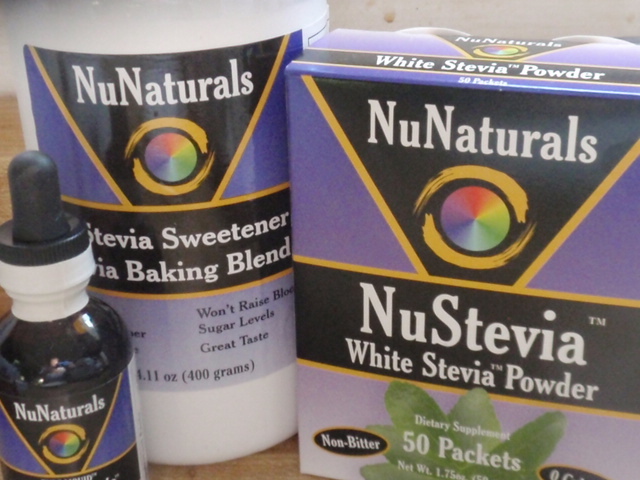 I did use 1/2 cup of the NuStevia artificial sweetener. Tony took one bite and said “this is really good!” Seconds later though, the aftertaste of the sweetener kind of made him throw up in his mouth a bit! 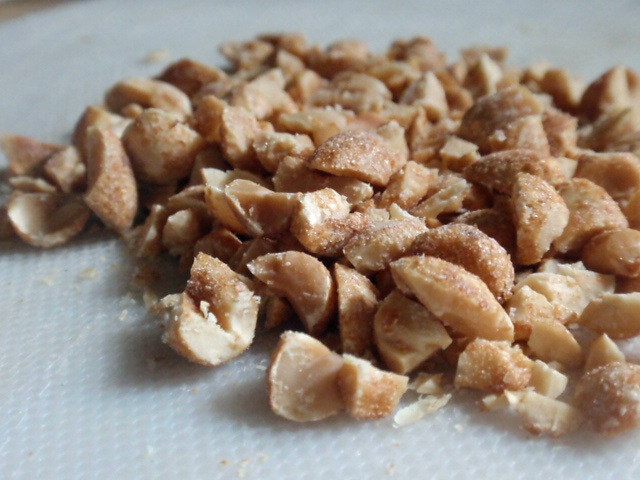 While I could taste the artificial sweetener, I didn’t mind the taste at all – and I almost tasted more peanut than banana. 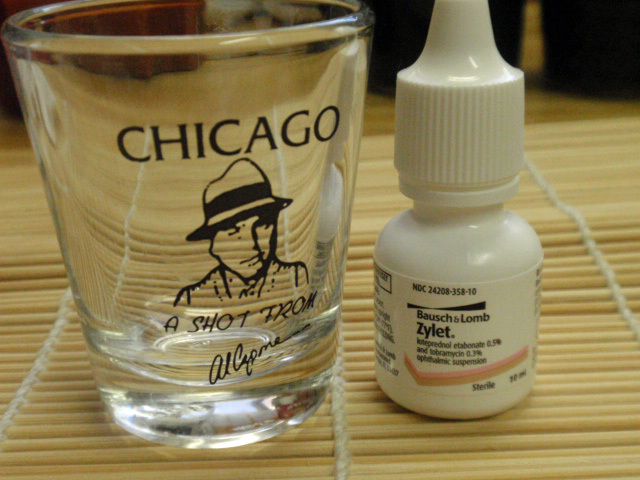 Only one slight problem – I didn’t do the math and realized it wouldn’t be done before going to the eye doctor! Tony took me just in case they had to put drops in my eyes and I wouldn’t be able to drive. So I just turned off the oven with 10 minutes left and left it in there. Hannah got home from school around 12:15 and she took it out for me – it was fine! 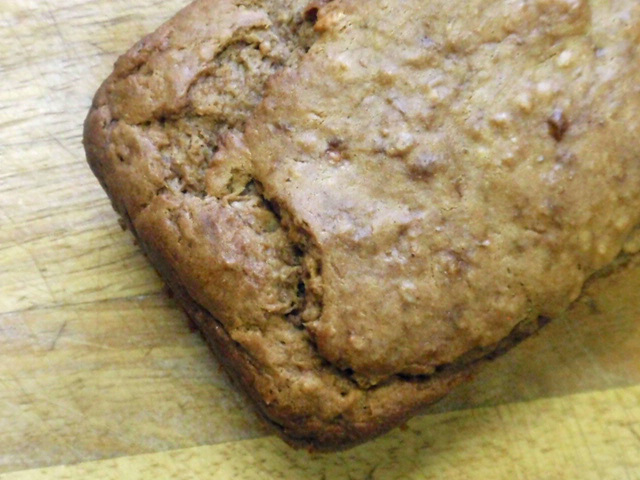 I love adding the chopped peanuts - I think I'll add them to all my banana breads! 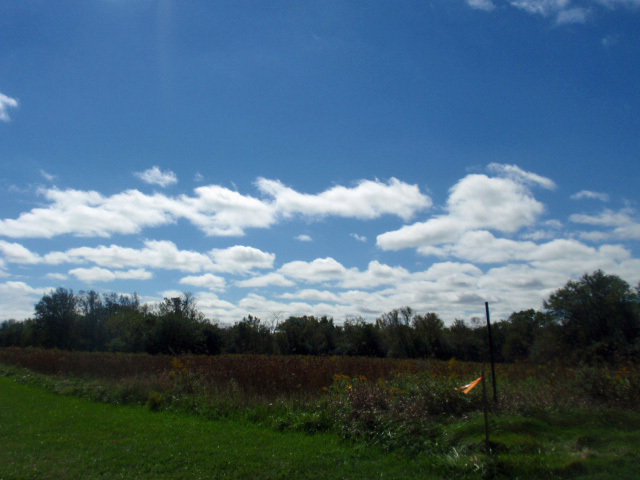 It was a gorgeous day yesterday – slightly cool – this is from the parking lot of Aldi, where, thanks to Veronica’s suggestion, I found canned pumpkin! and only .69 cents a can! 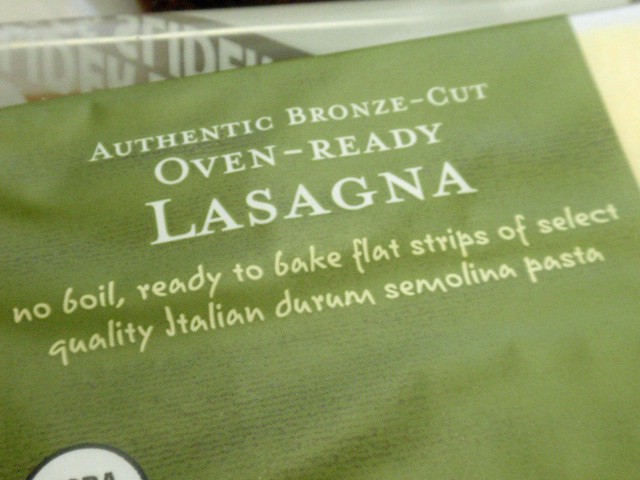 I had all the ingredients to make lasagna – I bought these lasagna noodles at my store’s discount rack – only .50 cents! So I kind of lost control of BSI these last several weeks. I was thrilled when our little contest made it all the way to India! But by the end the host was asking for vegetarian only recipes and requiring a logo be posted on every participants blog. The only requirement for BSI is to use the secret ingredient. This week my sister is hosting and she chose Pork! If you want to make a pork dessert – go for it! If you are new to BSI, check out what its all about here. Thanks again for everyone who voted for me in Project Food Blog! If you haven’t voted yet, I would appreciate it – here is the link – you have until tomorrow to vote. Biggest Loser is on tonight – are you watching this season? Monday . . . pink eye? I woke up yesterday morning to crusty eyes – not sure why because I wear contacts that you throw away every day. I wore my glasses all day yesterday hoping my eyes would get better, but they aren’t – especially my left eye. I am waiting for the eye doctor to open and see if they can squeeze me in this morning and just go into work late. 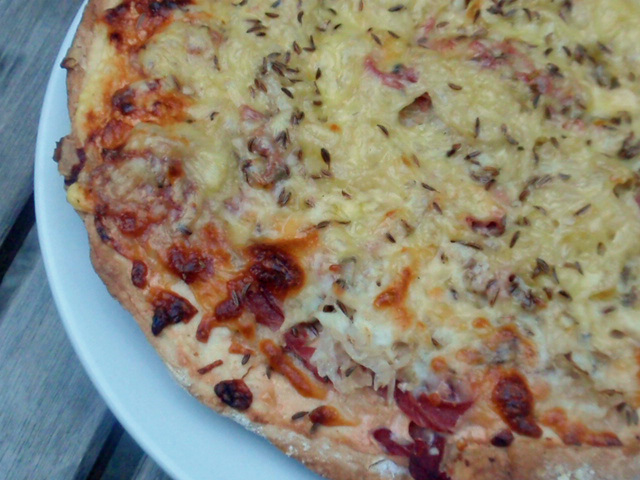 Did you check out my second Foodbuzz Challenge I posted yesterday? If you click on this link, just hit the heart at the top of the post to vote for me – I appreciate it! Since I was cooking all day yesterday, my eats were kind of weird. 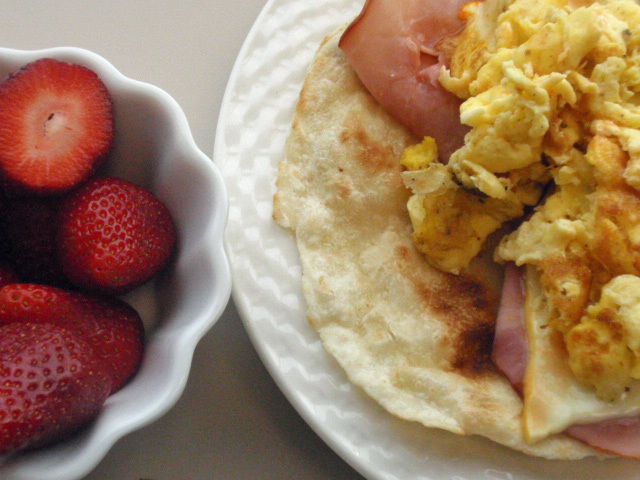 I did have a breakfast sammie with one of my rotis that I made – these are so simple to make I could make them every week! 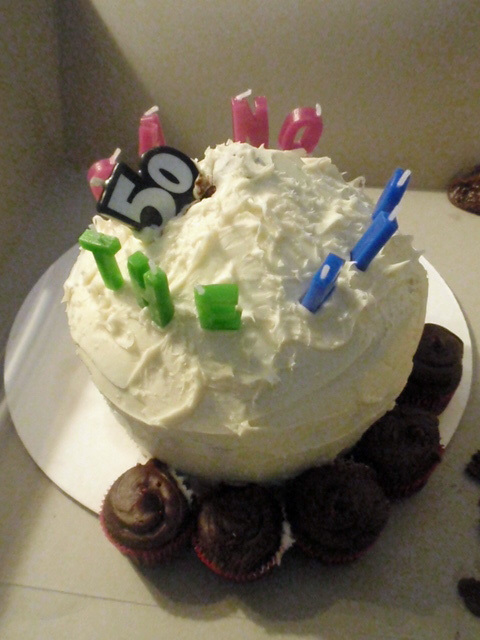 My SIL Jody came over yesterday and brought Tony a cupcake cake for his birthday – it was a spice cake and really good – one of her co-workers is starting up a cupcake business on the side. For Tony’s football food I made him guacamole (no pics!) 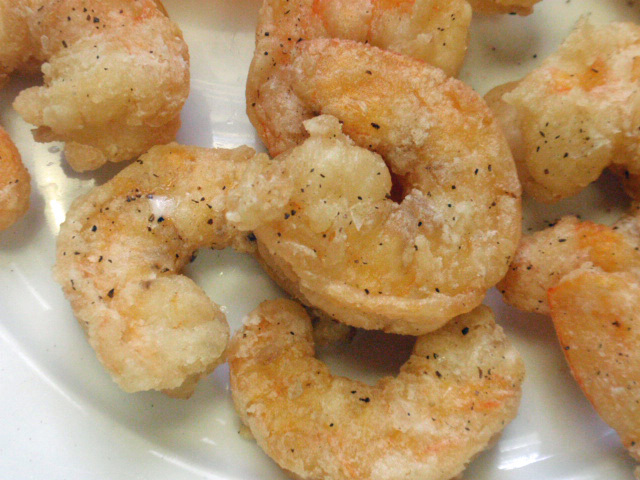 and I had some shrimp I needed to use up so I made him salt and pepper shrimp. 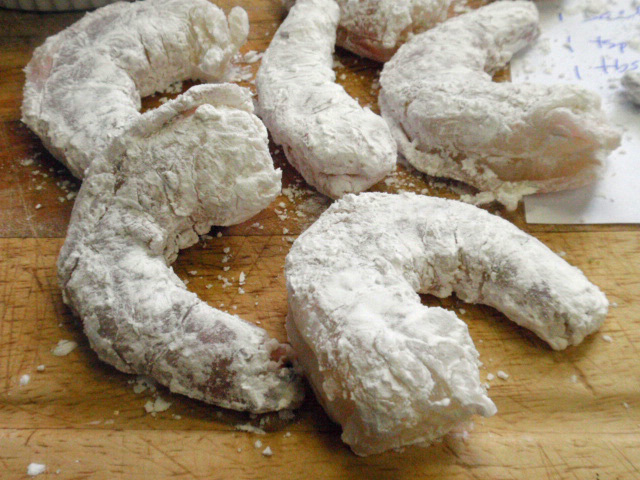 You simply toss the peeled shrimp in cornstarch, deep fry and then sprinkle with salt and pepper – I had sweet and sour sauce as a dip. 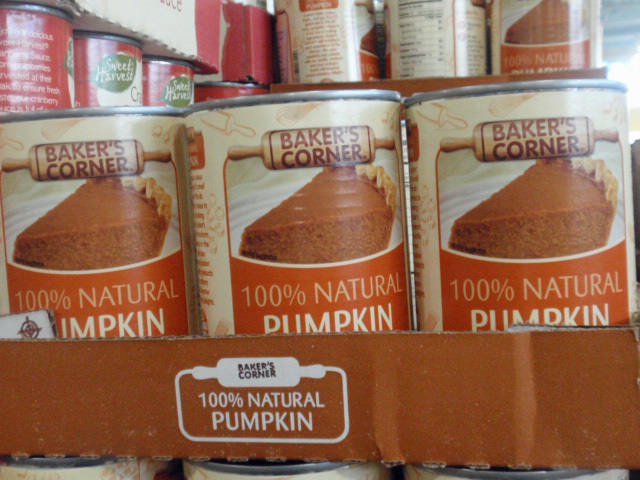 When Tony and I were at the store, we were in the check out lane and he says “did you see if they have any canned pumpkin?” I made a mad dash, so a store employee, and he said “I saw some on aisle 7 on the right hand side.” Score! 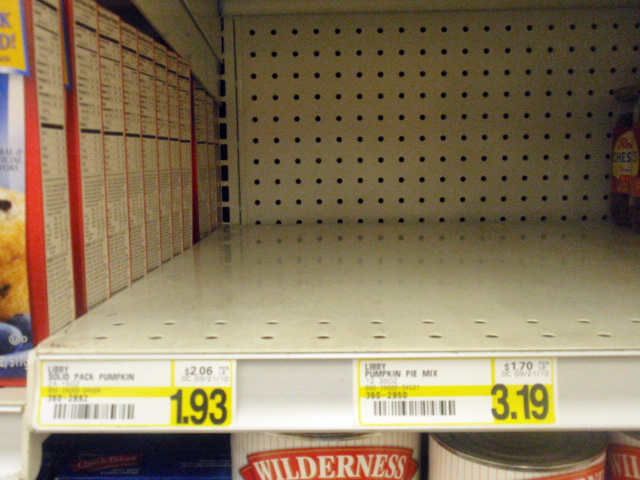 just as I've seen at every other store - a completely empty shelf! A huge thanks to Maggie for picking my name in her latest giveaway – so can’t wait to try this new artificial sweetener – it came with a ton of recipes too! I’ve been using artificial sweeteners for so long, I can’t taste it in baked dishes, but Tony always can – we’ll see if he can tell with this! 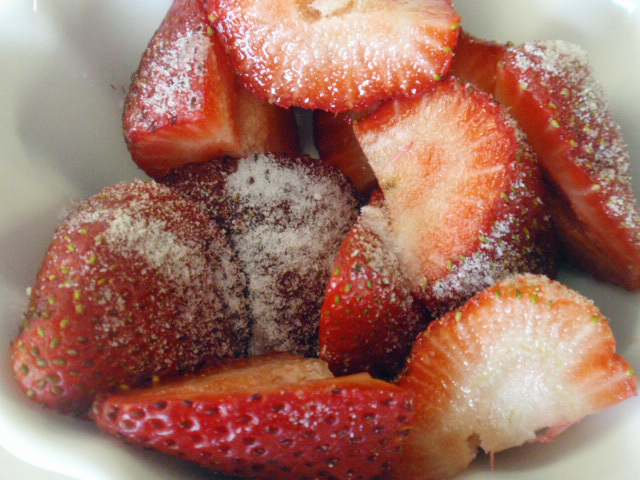 Do you use artificial sweeteners to bake? Have a great Monday – and thanks for your vote! 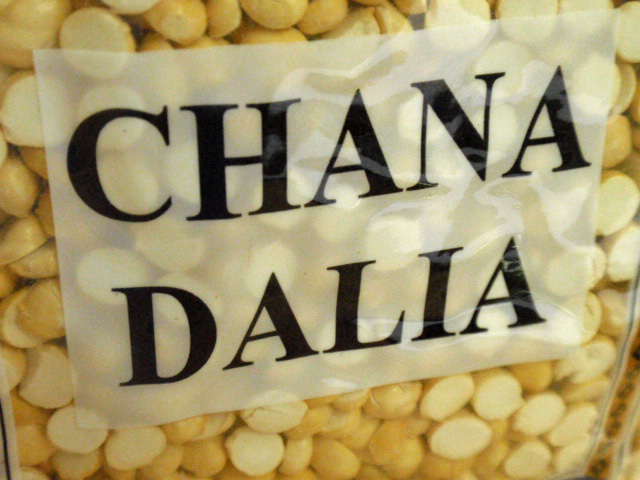 Project Food Blog – Challenge #2 – Welcome to Nepal! 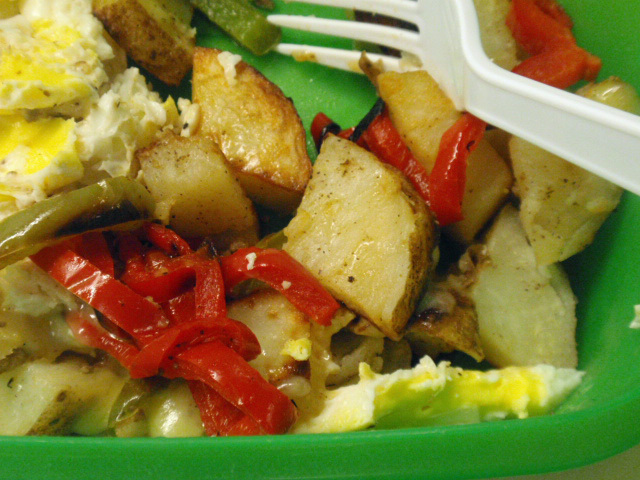 It kills me when I think of what a picky eater I was growing up. The only vegetable I ate were cucumbers. Summers at my grandparent’s house were spent with me cracking blue crabs on a picnic table covered with newspaper, and while I was awesome at getting out the crab meat, it never once touched my lips! Since I make a lot of Mexican dishes and Asian dishes, I wanted to do something completely different. With such a short amount of time to do research before this challenge had to be posted, I decided to first pick a cuisine and then start my research from there. I was telling a co-worker about making it to round two, and he actually gave me the idea of trying Nepalese food! I am horrible at geography, and didn’t really even know where Nepal was, but discovered that it is next to India and China. You can tell that both of those countries helped form Nepalese cuisine – especially using a lot of Indian spices like garam masala. I made this soup – its traditionally served over rice, which is the “bhat” part of the recipe title – I thought it was delicious on its own so I left it simple. Bring water to a boil. Add lentils remaining ingredients (except mustard seed), reduce heat and simmer for 1 hour, or until beans are soft. Using a hand mixer, puree. In a separate pan, add scant teaspoon of oil over medium heat – add mustard seeds and saute until they start to turn a darker shade. Let cool on paper towel. 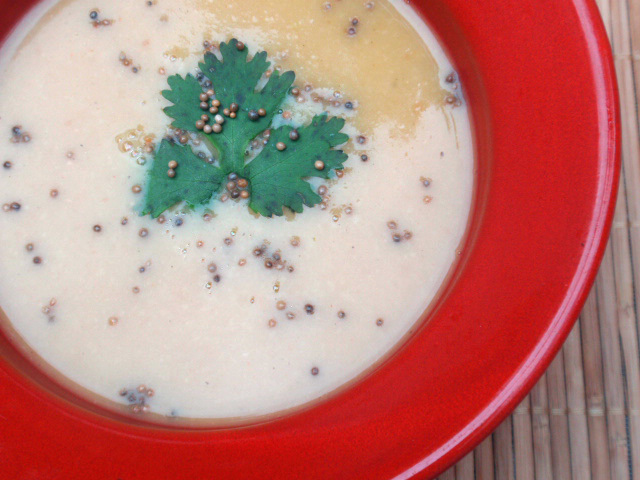 Garnish soup with mustard seeds and cilantro. this soup will definitely be on my rotation! 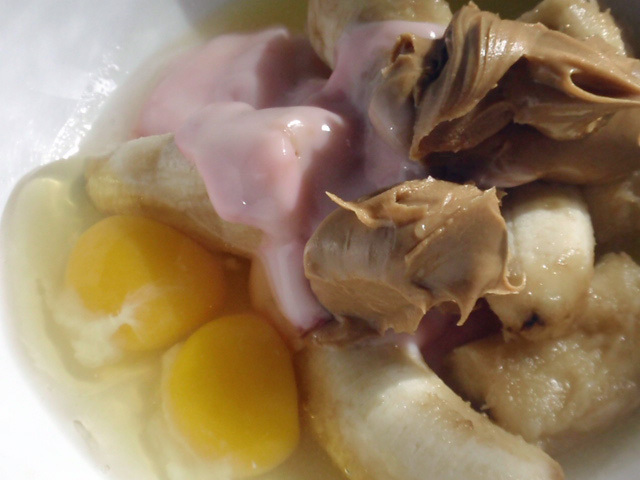 Mix all ingredients with a wooden spoon. 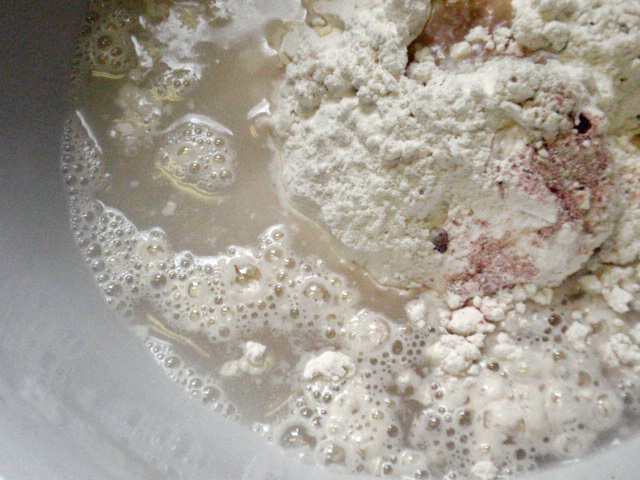 Knead the dough for 5 minutes. 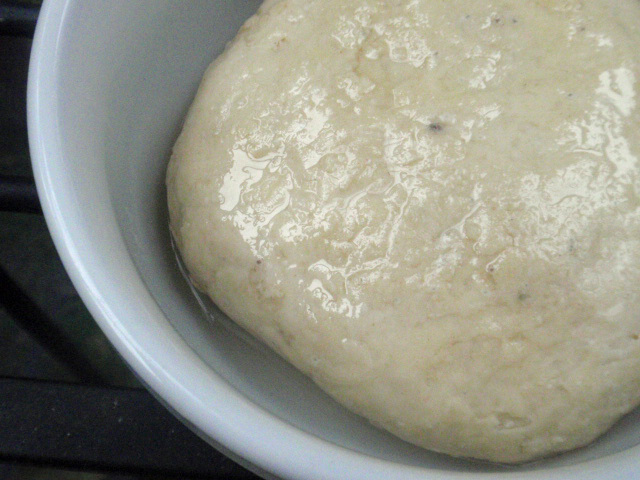 Put oil in bowl and cover dough in oil. Let rest for a minimum of one hour. 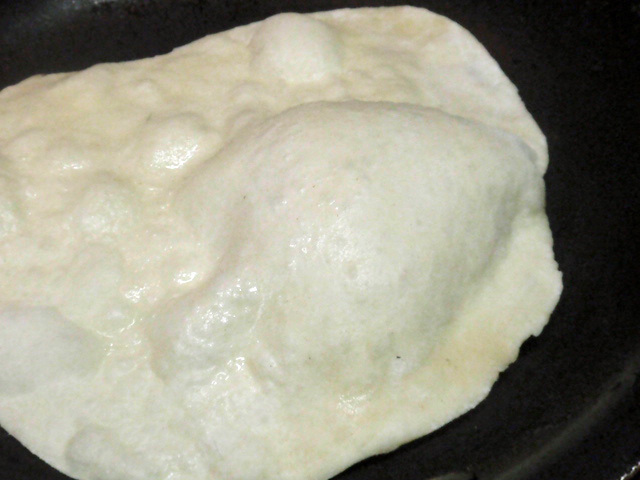 Heat oil in a skillet – pan fry over medium high heat until bubbles appear on the roti. Turn and cook the other side until golden. after resting for one hour - not really sure this step is necessary - it looked exactly the same as it did after I made the dough! I didn’t have any traditional ghee (clarified butter basically), so I just brushed each side with a bit of canola oil before it hit the pan. it puffed up a lot! I may have even had my breakfast sammie on one! Almost every site I went to had Momo has a traditional Nepal dish. 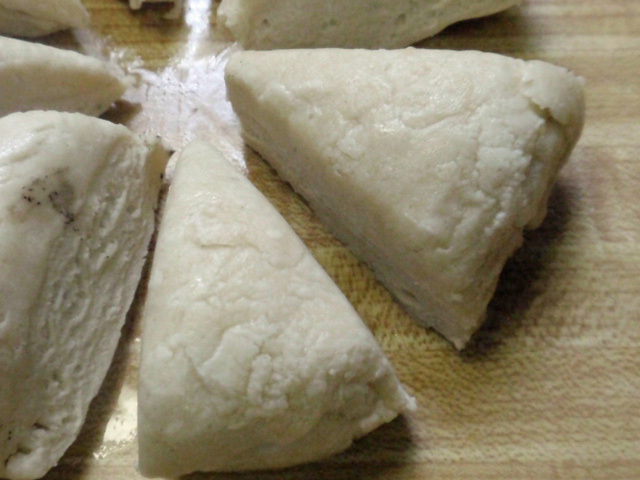 It’s basically their version of a dumpling. 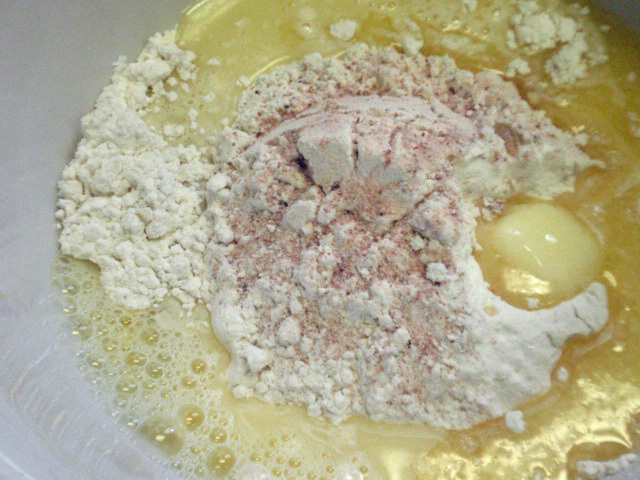 For the dough: Mix flour, oil, water and salt in a bowl. 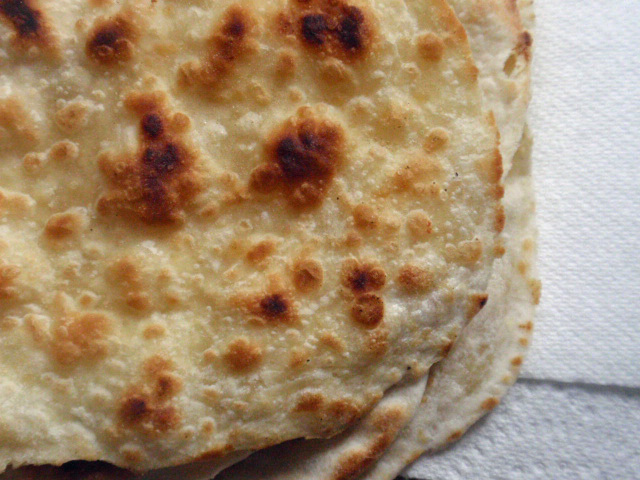 Dump on counter and knead the bread for 8 minutes – adding splashes of water if its too dry. Let the dough rest 30 minutes. Meanwhile, add remaining ingredients in a food processor and mince the meat. 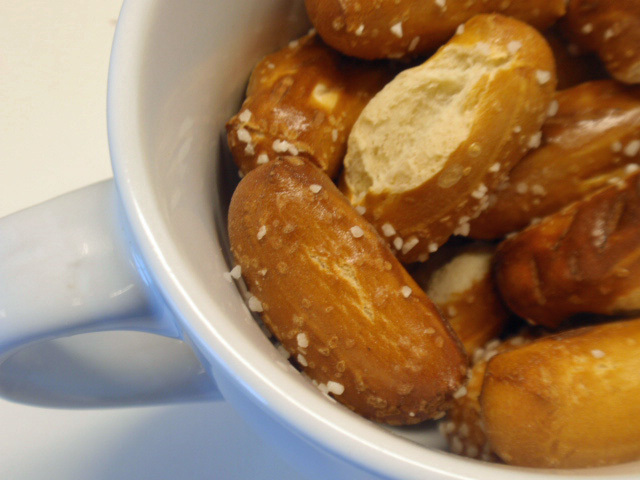 Put in a bowl. 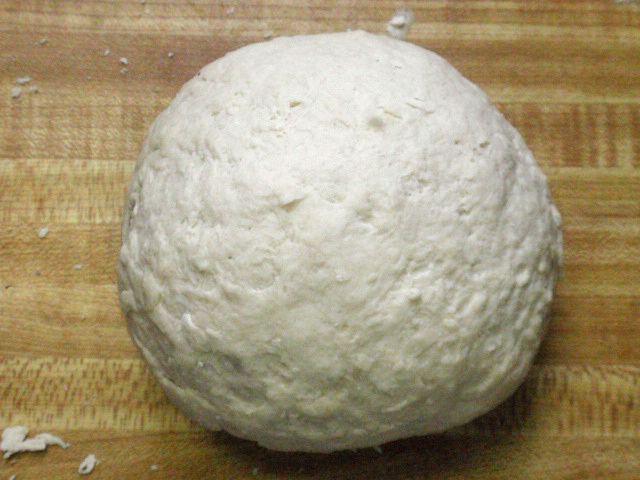 Take a piece of dough about the size of a golf ball and roll it out to about 4 inches. 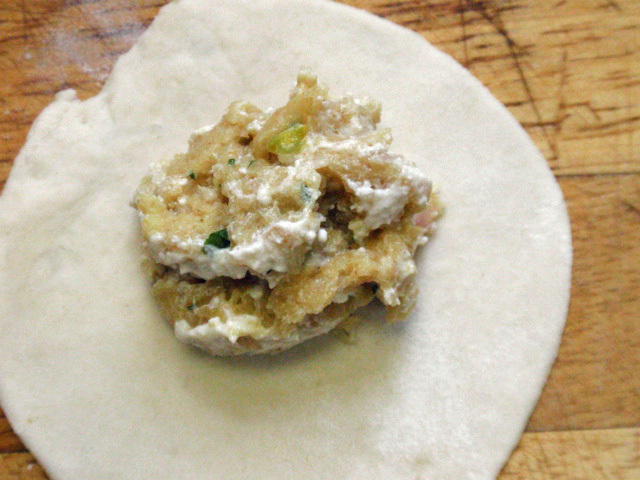 Add 1 heaping teaspoon of meat mixture and wetting the edges of the dough, crimp the dumpling together. Steam for 20 minutes. Alternatively, you can cook the meat mixture until almost done, add to dumpling and deep fry for 2 minutes, or until golden brown. 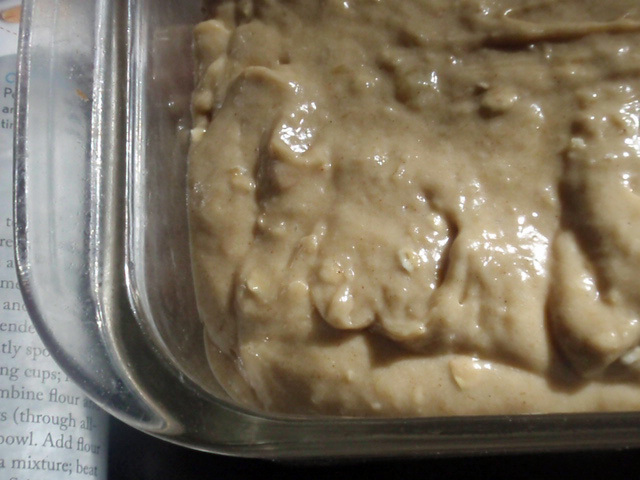 Once I mixed this together, it was a bit dry, so I wet my hands while kneading it and it came out really good. Again, not sure the resting time is actually needed! 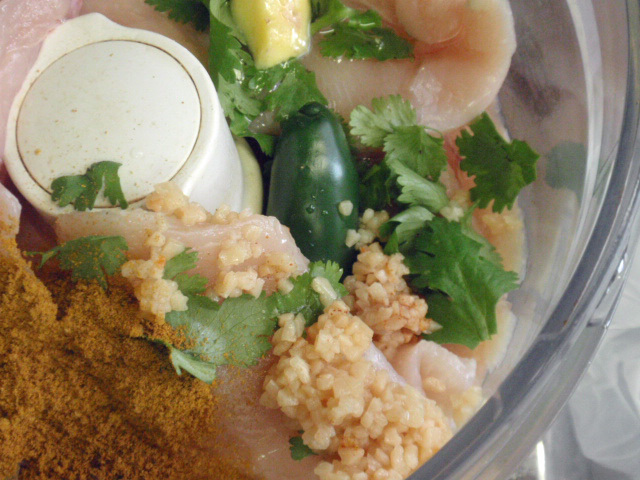 I threw my filling into the food processor to mix it all up - note - don't throw a big chunk of ginger in here - I found big chunks of it and had to pull it out. 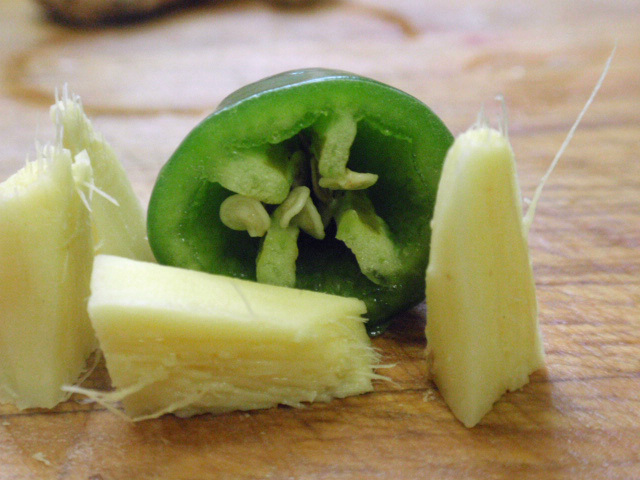 Next time I'll grate the ginger. 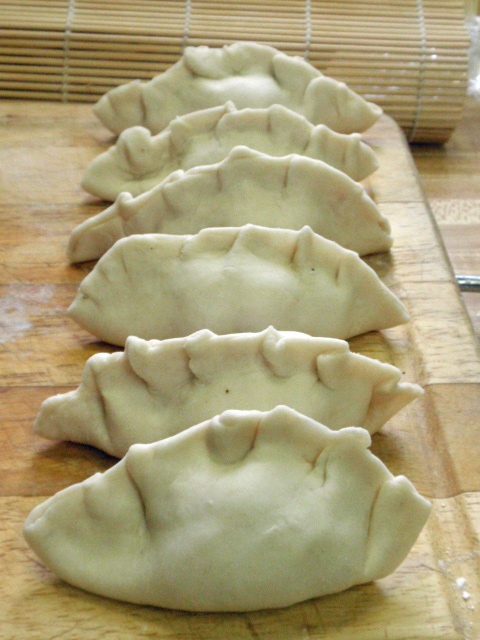 Just as I would with wonton wrappers, I wet the edges before crimping the dumplings. Don’t worry if you don’t have a steamer – I don’t have one either – just put a colander over a pot and put a lid on top. 20 minutes later - they were done! 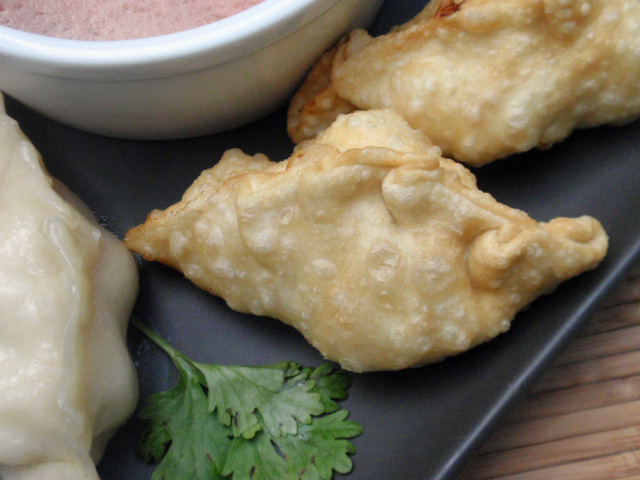 I saw both steamed and fried momo’s – so I did them both. Except for the fried version, I didn’t think the chicken would cook in time before the outside was done, so I just pan fried some of the chicken mixture until it was almost cooked through, and then crimped as I did the steamed ones. 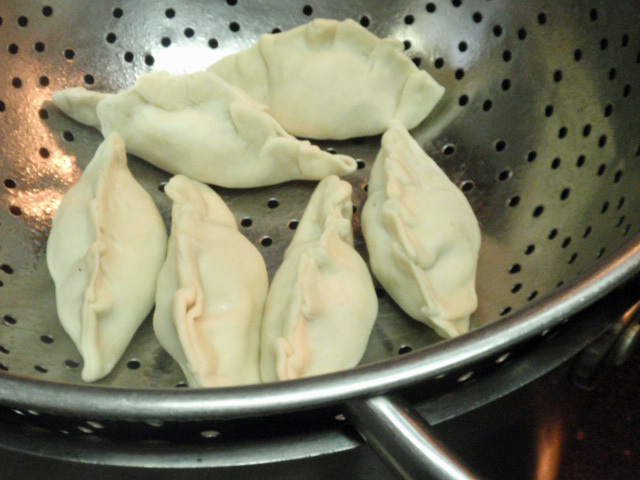 These momo’s were very good – however, Hannah and I both thought they would be better in a chicken dumpling soup! 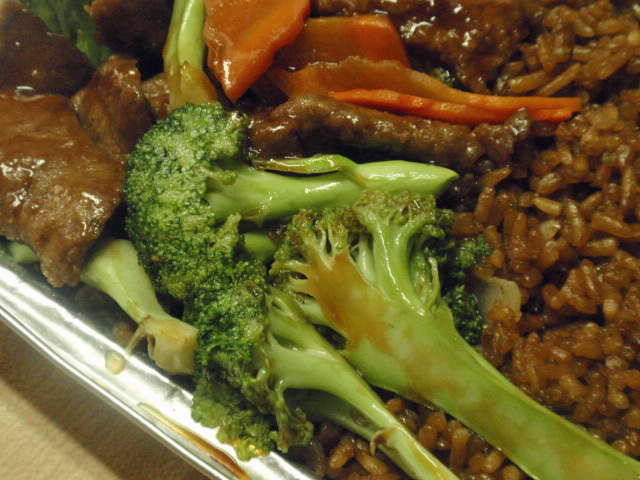 What really made this dish for me though, was the dipping sauce – so spicy and good! Simmer all ingredients for 15 minutes. Using a stick blender, blend until smooth. I made it to Round Two! and . 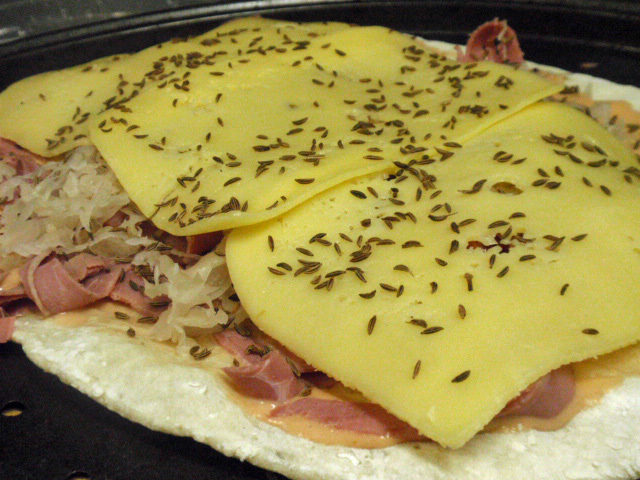 . . Reuben Pizza! 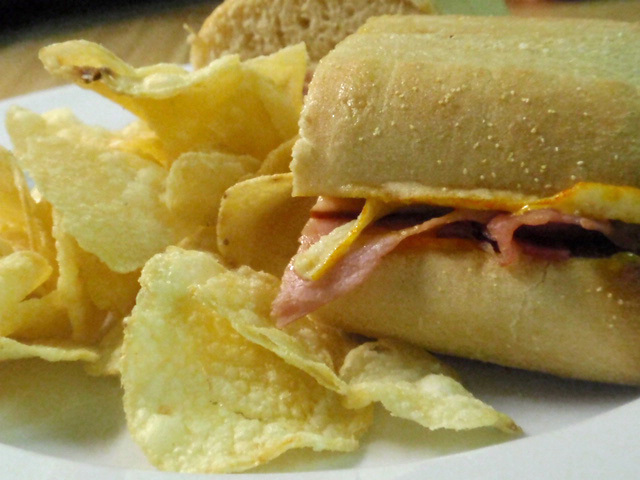 I was so excited to learn that I made it to Round Two of Foodbuzz’s Project Food Blog! 😀 Now the competition gets more fierce – out of the 400 who made it to Round Two, only 200 make it to Round Three! So what is Challenge Two? 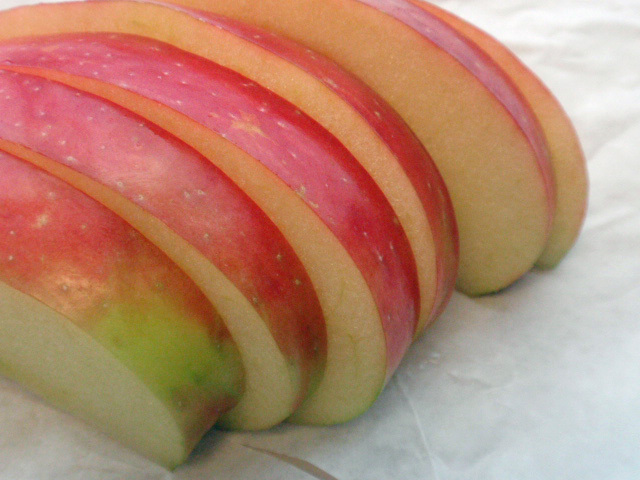 Yesterday I had my first honey crisp apple of the season – I paid $2 for it as Whole Foods, but I was fine with that because they are so worth it. Worst.Apple.Ever. It was so tart, I couldn’t even eat two slices of it! 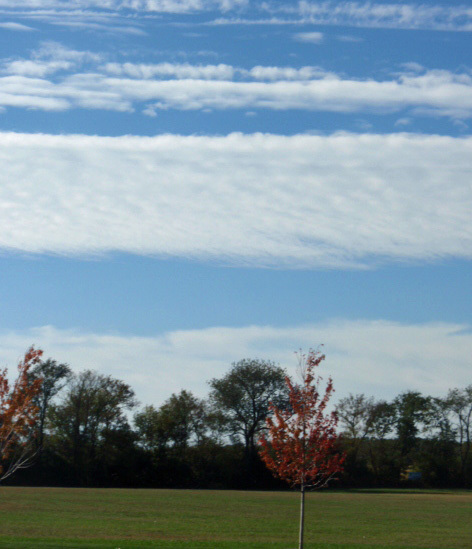 Even though it was really windy yesterday, I decided to walk at lunch – I ran an errand to the grocery store and ended up walking for 60 minutes! 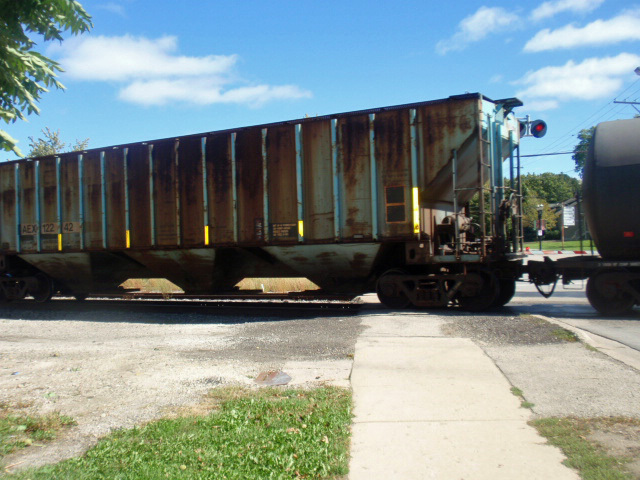 I got stuck by a train for a few minutes – isn’t it weird how there is no barrier from the sidewalk to the train?? Ever since Tony’s birthday lunch attempt to go to a good deli didn’t work out, I have had corned beef on the brain! 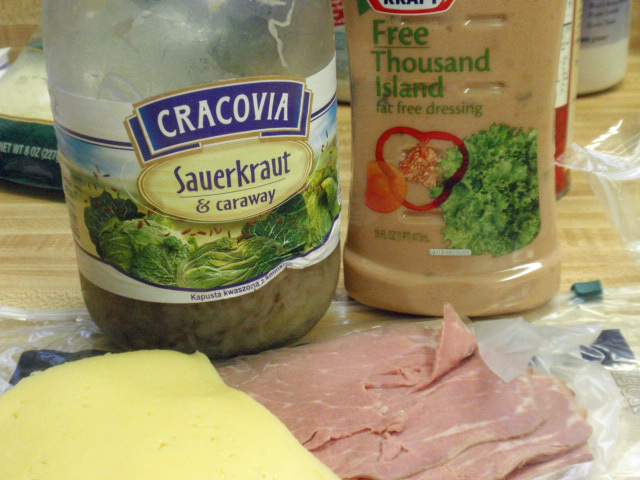 I picked up 1/4 pound of it at lunch, I had all the rest of the ingredients at home: fat free thousand island dressing was the base, then shredded corned beef, sauerkraut (that had been drained) and swiss cheese on top. 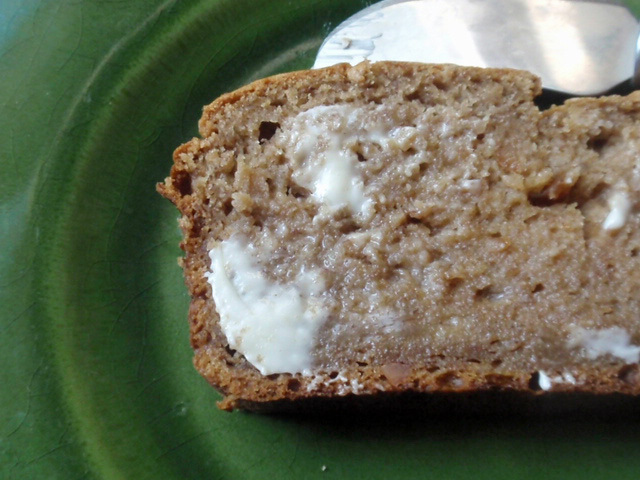 Oh, and I also sprinkled caraway seeds over the top – that made it extra delicious! 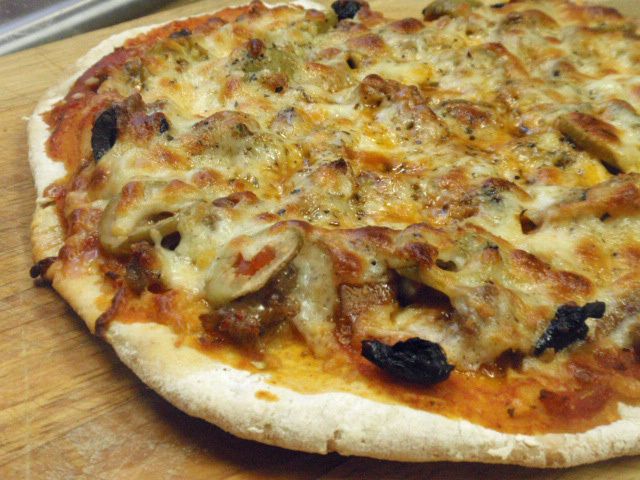 I am still trying to find a crust that Tony likes – I like a crispy crust, he wants slightly crispy, but chewy too. 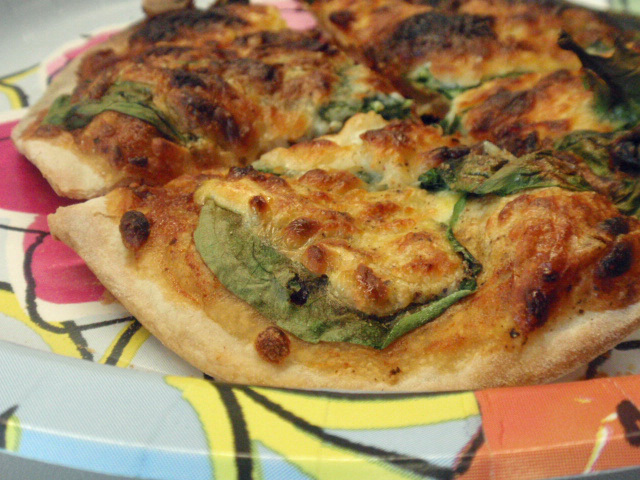 Maybe next time I’ll keep his pizza on the pizza pan the whole time and maybe lower the temperature? We slept in until 9:30 this morning and we were both hungry so we went out for breakfast and went to the grocery store – it feels weird blogging at 1:15 in the afternoon! So come on back tomorrow for submission for Round Two! And thanks again for everyone who voted for me during the first round! 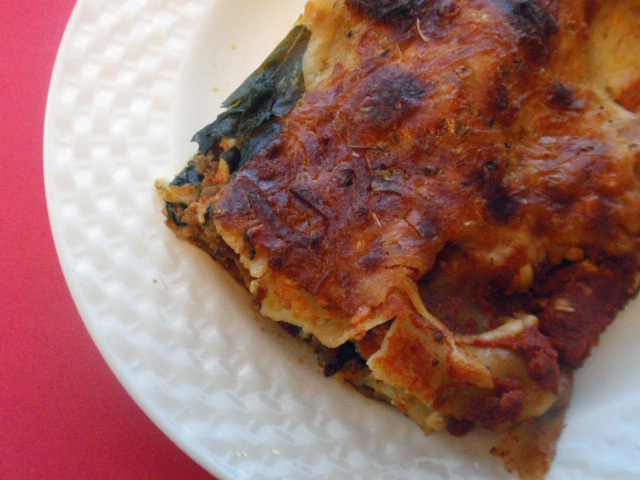 Is there a cuisine you have yet to try at home? Yesterday marks 100 days before the end of the year and I am joining Steve’s Hot 100 challenge for the end of the year. I’ve realized in the past week or so that I have had too many licks and tastes of things I am making, so I need to be more mindful. So what are my goals? Lose 10 pounds. Sounds easy doesn’t it? Yet I haven’t lost a pound since I started this blog two years ago. 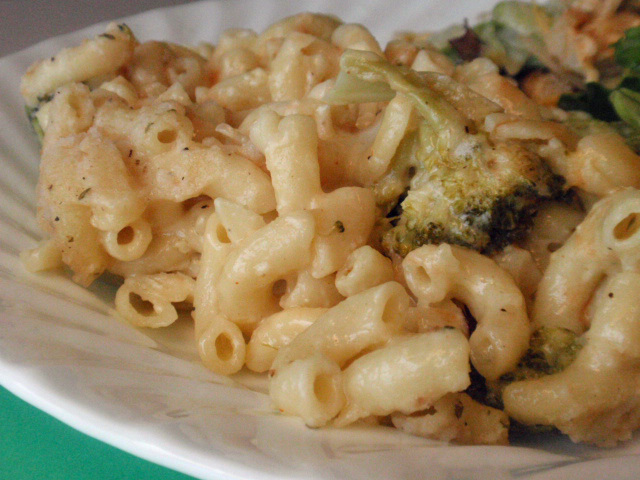 Portion control – I need to bring my scale out again – I think my 1 cup servings of pasta have gotten a bit big lately. More fruits and veggies! Seriously been slacking on this one lately. Strength train at least 3 times a week. I think I do too much cardio and not enough strength training. Thanks Steve for putting this together again this year! 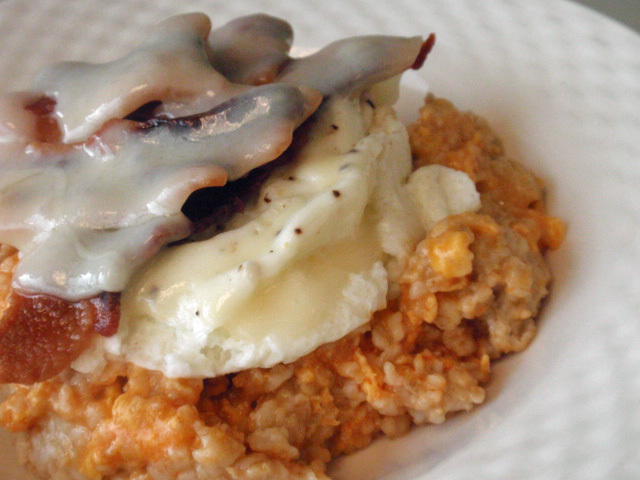 Breakfast was my spicy oats – topped with egg whites, 2 slices of really well done bacon (I actually like it almost burnt!) and swiss cheese. I went to the gym and you would have thought I hadn’t worked out in a year! Why is it that just a few days away from working out and it’s almost like starting from scratch? 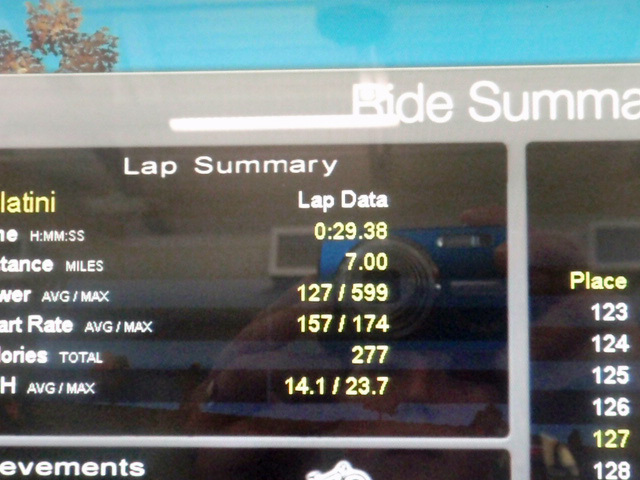 The bikes were taken so I did 40 minutes on the elliptical. 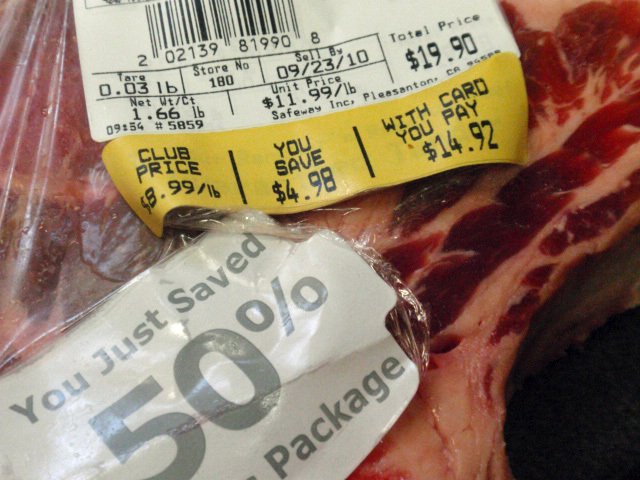 I’ve talked about my grocery store having a 50% off bin for meat that needs to be sold that day. 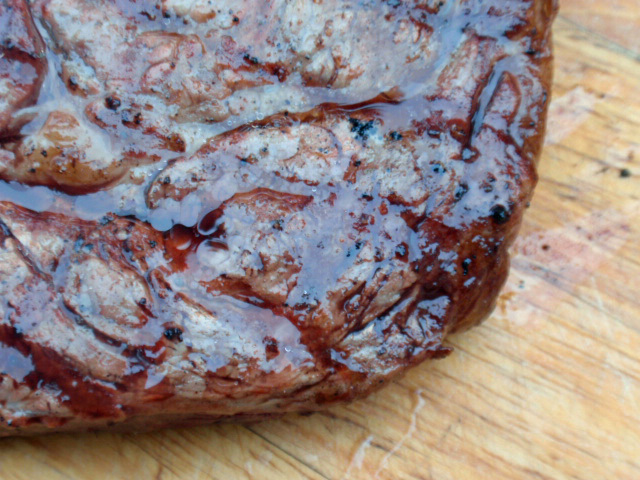 I spun the 50% off wheel and picked up a 1.6 pound bone in ribeye – score! 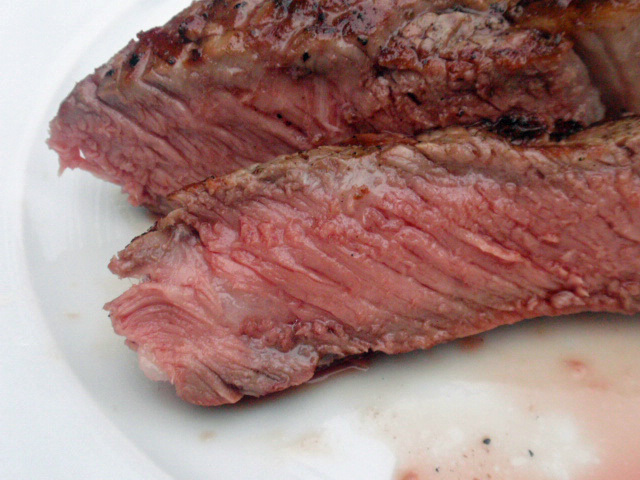 Tony grilled it to perfection - so juicy! 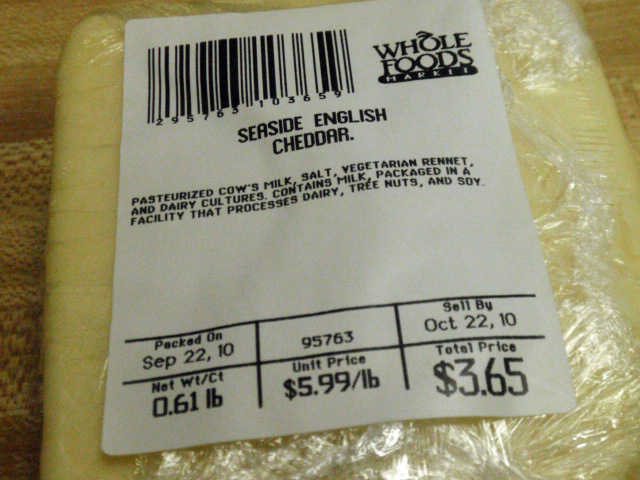 I made twice baked potatoes on the side – none of those pictures turned out, but I used this cheese from Whole Foods – did you know you can just ask them to try any cheese? And thanks to Beth, I have a new screen saver at work!